Packaging technologies are getting better at displaying only what manufacturers want us to see. Browsing the processed meats display cooler (one of the most heavily trafficked areas in any grocery store) for a great-looking package of lean bacon is difficult. There are so many different types of bacon, hot dogs, sausage, scrapple and assorted meats shoved into the same display area that’s it difficult to tell which item tag belongs to which item. Bad design: time consuming, frustrating and confusing within a crowd of people vying for space while checking out the goods, especially when I am not the only one peeking through the clear plastic window of each and every one to make sure that the particular package does indeed contain bacon rather than pork fat. Sometimes, a line of shopping carts pile up such that the patrons trapped in-between cannot even move, moreover browse the bologna labeling. As a result, savvy shopping cart drivers often park their carts in nearby aisles in an attempt to avoid the gridlock, resulting in mini-traffic jams all over the store. I think it would make sense for bacon manufactures to package bacon with a representational slice clearly visible through the front window of the packaging and to remove the cardboard flaps altogether from the rear side of the packaging. Who wants to buy a package of bacon with an already torn open cardboard window pane anyhow? I admit it. I have several of those food chopping contraptions — the kind you get as gifts during the Golden Years — the ones that allow you to repeatedly whack a plunger and chop, Chop, CHOP until you are blue in the face. Terrific for Kitchen Stress Disorder Syndrome, (KSDS). Chop, Chop, CHOP away that stress. I threw 5 pieces of very crisp, refrigerated, pre-cooked bacon and a thick slice of red onion onto a chopping block, plopped the gizmo in place and hammered away until there was nothing left but a purplish, pasty blob that matched the color of the bruise on the palm of my hand. Then I scooped the glob in a small mixing bowl, added a dollop of mayonnaise, a dab of tartar sauce, a pinch of chives and a dash or red pepper. Last week I did something I’ve wanted to do for years — I threw out all Mom’s gift glass sauce pans and skillets. Anything with a handle was thrown in the recycling bin. Those pots and pans had wasted space in my cabinets for far too long. I mean, really — even water burns in those suckers. To be fair, I spent about half an hour thinking about some of the pros of stovetop Pyrex. Lots of cons bounced around in my head, but the only positive thought I could come up with is: you are able to watch your food burning on the bottom. My friend, Rich sent me a video link for an absolutely amazing demonstration of a Master Chinese noodle-maker making wheat flour noodles. Being a lover of Chinese cuisine in general, and Chinese noodles in particular, I watched this video a half dozen times. Truth be known, I like all types of noodles regardless of their ethnicity, and have yet to meet a noodle I did not like. Be aware that an idiot used a word or two of uncalled for language on the web site. The video is what’s important. Not the idiot. Afterwards, I searched Google for “Chinese wheat flour noodle recipe“. There are a ton of them out there. For those of you who, like me, are less acrobatic than the Master Noodle Maker above, you might want to check out this traditional, albeit more boring approach. Scroll down to the bottom of the page and click on the “back to recipes”, or click here instead. You will be amazed all over again. Before you begin slinging those noodles, take a moment to browse these outtasight Chinese Noodle images. Back in the early 70s — long before Recipe du Jour — Rich, Walt and I opened a custom photography lab, the Tidewater Picture Company, in Norfolk, Virginia. Remember darkrooms? They are nearly extinct now, having yielded, begrudgingly through the years, to digital photography and Photoshop. One of the cool things about darkrooms is that the equipment used in them was built to last. Such is the case with the GraLab Model 300 darkroom timer. Set the minute hand with the push of a finger, flip off the lights, and a plutonium-green luminescence circled around and ’round, ticking off minutes in the pitch dark. Amazing construction. Flawless performance. Cooper ATKINS FT24 (heavy duty, 24-hour no-BS timer. 7-inches tall. I have not had much luck with kitchen timers: they are not loud enough and they break way too easily; one tumble from a countertop and you will be stepping on tiny pieces of plastic and stainless steel springs for weeks. Being somewhat hard of hearing, my television’s constant over-volume ruckus, my dishwasher churning at stubborn food grungies, hell, even the inside-my-head crunching of popcorn, make hearing a wimpy, wind-up kitchen timer impossible. Last week, I finally got fed up enough to do something about my problem: I did my research, read reviews, eventually buying the Cooper ATKINS FT24 from Amazon for about $40. Powered by 4 macho “C” batteries, the FT24’s adjustable volume can announce an end time with enough force to cause an avalanche, a gentle purr, or no sound at all because the FT24 quietly flashes a red warning light if you want it to. Mom used to call such great purchases “terminal” products, ones that will never break or cause problems and will outlive you by decades. The Cooper ATKINS FT24 timer appears to be a keeper. Glad to see I haven’t lost my touch. Stevia in the Raw. I love it. I have been a “Sugar in the Raw” user for years. In fact, I haven’t any white sugar in my home. I figure I eat enough processed foods as it is, and it just makes sense not to add processed sugar to the list. I have never felt comfortable with “artificial” sweeteners; they have not been very taste-bud friendly to me, and in my mind, chemicals are even worse than the “p” word in processed foods. I have been reading about the “Stevia” movement for half a decade or so, ever since I saw a talk show where somebody or another was soapboxing this new “miracle plant” discovered in the back-bush country of Africa. I don’t buy that spin. Stevia: 300 times more sweet than sugar! As with most products — even ones with an apparent 1,500 year track record — there is always controversy surrounding its safety. I discovered this “Is Stevia a Safe Alternative to Sugar? All those with a sweet tooth must read!” article, and decided it was objective enough for my FFT: “Stevia” Sugar Substitute blog article today. As always — here comes my disclaimer! — search Google and then make up your own mind. Do that, and we will both rest more easily. It was no surprise to me that I bought a bag of “Stevia in the Raw” last week when I saw it in my local grocery store; I drink a LOT of sweet tea during the hot North Carolina summer months, and I gotta tell you, I fell in love with Stevia with my very first batch. Stevia comes in all sorts of different forms: fresh, dried, extracts, concentrates — you name it. I have only tried the “Stevia in the Raw”, version, but for now, here’s why I like it: “Stevia in the Raw” is a white, pourable, 1:1 ratio-sugar-look-alike powder, and I am set in my ways. I’d rather put a tablespoonful in my tea than drip a greenish liquid fluid on Earle of Gray’s forehead. NOTES: the “Stevia in the Raw” folks mention on their packaging that, for BAKING purposes, 1/2 of real sugar should be substituted in order to maintain moisture content. 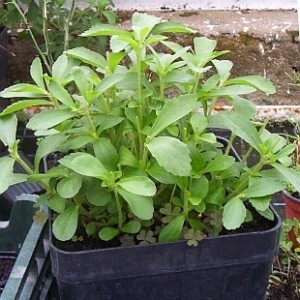 Stevia plants and seeds are also available at most nurseries (looks kinda like mint, very beautiful plants that apparently can be grown indoors, too); plant your own and mess around with the possibilities. “Stevia in the Raw” recipes.